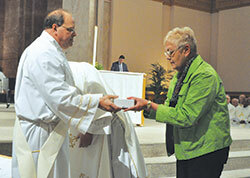 The annual archdiocesan chrism Mass celebrated during Holy Week on April 11 at SS. Peter and Paul Cathedral in Indianapolis was much like the same liturgy in years past. But there was something missing, something significant. The cathedra, the seat in the sanctuary reserved for the archbishop and a symbol of his teaching authority, was empty. It has remained that way since Cardinal Joseph W. Tobin, previously archbishop of Indianapolis, was installed on Jan. 6 as the archbishop of Newark, N.J.
Bishop William L. Higi, the retired bishop of Lafayette, Ind., was the principal celebrant of this year’s chrism Mass. “And yet I know that God is with us,” Msgr. Stumpf said. “I have felt that time and time again as we join together to continue the work in the Church in southern and central Indiana. Benedictine Sister Antoinette Purcell, a member of Our Lady of Grace Monastery in Beech Grove, has experienced such periods of transition several times since she began ministry in the archdiocese in 1964. She was at the chrism Mass to receive the blessed oils for the St. Paul Hermitage, the retirement home in Beech Grove operated by her monastic community. But the chrism Mass for her is still a powerful part of her experience of Holy Week in which she prays with Catholics from across central and southern Indiana. Pam Doyle, pastoral associate of St. Andrew the Apostle Parish in Indianapolis, knows that connection firsthand. She received blessed oils for her faith community that would be used when two people would be received into the full communion of the Church during its celebration of the Easter Vigil four days later. The universal reach of the Church also touches people who are sick and close to death. Deacon Jeffrey Powell presented the oil of the infirm during the chrism Mass that was blessed by Bishop Higi. It will be used throughout the coming year whenever anyone in the archdiocese receives the sacrament of the anointing of the sick. In addition to the oil of the infirm, the oil of catechumens and sacred chrism oil were also blessed during the liturgy. The oil of the catechumens is used during the sacrament of baptism. Sacred chrism oil is used in baptism, confirmation, the ordination of priests and bishops and the consecration of church buildings and altars. The chrism Mass also featured the renewal of ordination promises by some 100 priests serving in the archdiocese. Ordained last June, this was the first time he renewed his ordination promises at a chrism Mass. But it wasn’t the first time that he has recommitted himself to priestly life and ministry. Msgr. Stumpf said in his homily that all that takes place at the chrism Mass and the people witnessing and participating in it share a powerful message. “All of us gathered here are [Christ’s] anointed disciples,” he said, “the laity, the bishop, the priests, the order of deacons, the consecrated religious, the parish life coordinators, the seminarians and the candidates for the permanent diaconate.